In the past few years, hedgehogs have completed the transformation from slightly prickly woodland creatures to trendy, lovable rockstars, found on everything from t-shirts to pillows to children's toys. We're excited to share Judy Hansen's newest collection, Hedgehog Village, with you. Jump into the daily life of these adorable hedgehogs, complete with charming cottages, a watercolor wildflower field, and other cute coordinates. JH: I’d previously had an owl fabric collection (Night Owls) and it had done very well, so I wanted to do another critter. I actually researched popular animals and came up with hedgehogs—they’re popular worldwide! Q. What do you think is so appealing about this collection? JH: It’s appropriate for all ages. 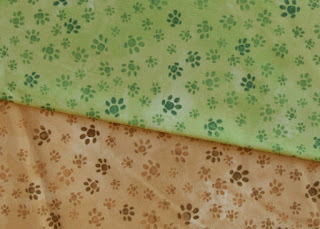 You could make a quilt for a children’s room, a sewing room, or even a travel quilt for the car. Plus the hedgehogs are adorable! Q. Can you talk to us about the focal print? 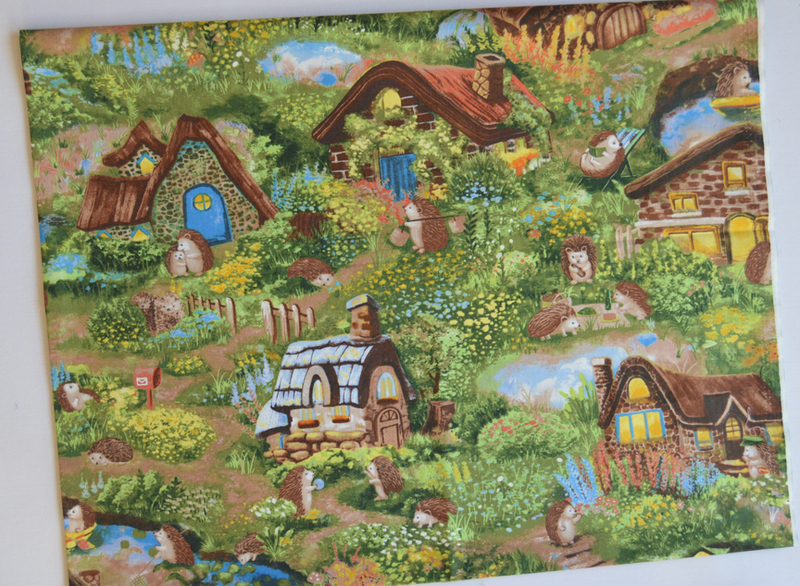 JH: The style of this print is based on the work of artist Thomas Kinkaid. His cottage seemed the perfect place to host a little hedgehog. 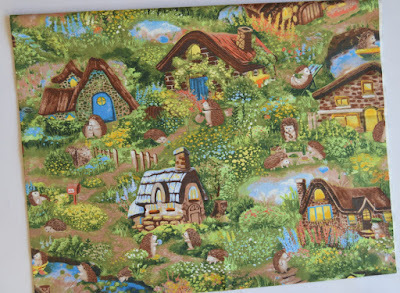 This fabric is hand painted—my take on one of his cottages in the woods. Q. The little hedgehog print is super cute, too. JH: I love it. For the hedgehogs, I did about six different paintings—hedgehogs standing, sitting, hugging, with arms extended… they’re such playful little animals. Q. What about the other coordinates? JH: They’re all from original artwork. I’m very painterly, and I think that shows in the floral print. It has a whimsical feel. 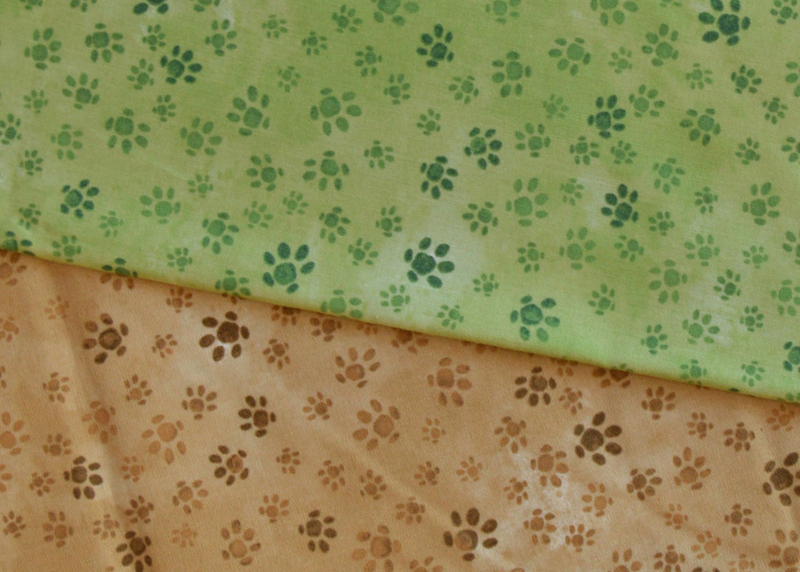 The pawprints are more fun than a plain tonal—they have character and fit in well with the hedgehogs. Q. How did you come up with the color palette. JH: It started out based on the cottage painting, but then I brightened everything up. I wanted warm, springy colors, and I wanted the line to have an outdoor feel. I think the peach (in the hedgehog print) is my favorite color in the collection. JH: Definitely the main fabric with the cottages. It has so much opportunity for different uses! And if you look closely, there’s a lot of detail in it. Judy also designed a free quilt pattern using the Hedgehog Village fabrics. 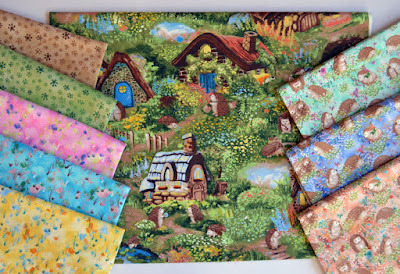 See the entire Hedgehog Village collection here and ask for it at your local quilt shop. This is so adorable! I love the free pattern. 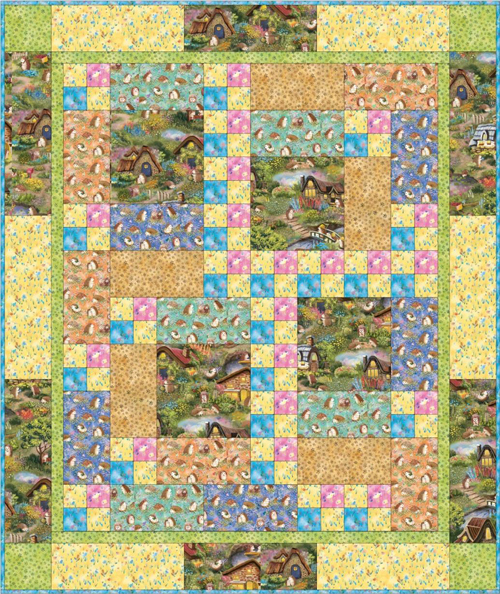 Also, a great quilting friend of mine has a daughter who Loves Hedgehogs and has a couple of them as pets. So, I made sure and sent her a link through facebook! 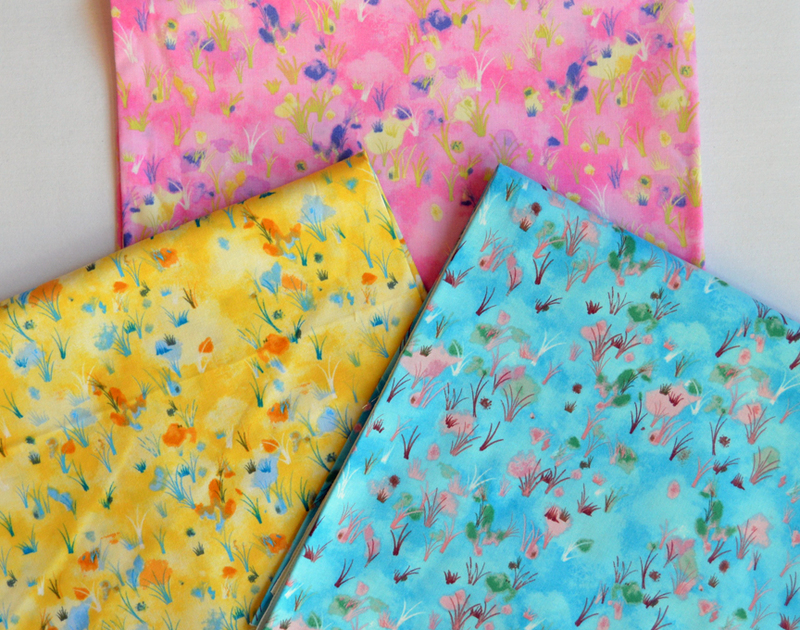 I know she will want to buy a whole kit and kabudoodle(just a fun word we use)of this fun and fantastic fabric collection! Thanks for sharing!